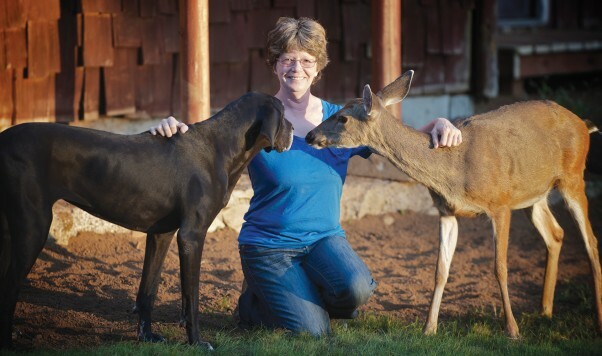 Kate the Great Dane and Pippin the deer form a bond that has touched people around the world. and people are dancing tango. Not just any kind of tango. They are dancing close embrace tango, with the partners chest-to-chest and moving to the melodic strains of golden age (circa 1930s) tango music. and I liked the music,” says Claude Bigler of how he first came to discover tango. 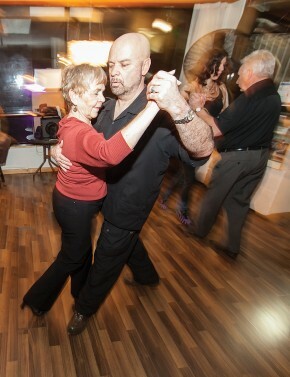 Now an instructor, he teaches students like Christina Grandin, above, the close embrace tango on Wednesday evenings in Downtown Courtenay.” src=”http://www.infocusmagazine.ca/wp-content/uploads/2013/02/tango1-602×415.jpg” width=”602″ height=”415″ /> “I heard this beautiful music, and I liked the music,” says Claude Bigler of how he first came to discover tango. Now an instructor, he teaches students like Christina Grandin, above, the close embrace tango on Wednesday evenings in Downtown Courtenay. and its deep, trumpet-like call.” src=”http://www.infocusmagazine.ca/wp-content/uploads/2013/02/swan-2-602×456.jpg” width=”602″ height=”456″ /> Trumpeter swans mate for life and can live upwards of 25 years. The adults are snowy white and their young—called cygnets—are grey. The young swans’ plumage changes when they are about one year old. The Trumpeter swan is distinguished by its larger size, its all-black bill, and its deep, trumpet-like call. Every Tuesday morning at 10 o’clock, from the last week of October to the last week of March, a group of dedicated volunteers travel to 21 different locations throughout the Comox Valley to count swans. Steph Nathan is one of them. Nathan and her naturalist friends don’t just count these giant white birds for the fun of it. Their efforts to track Trumpeter swan populations have been instrumental in helping to create a highly successful swan management program in cooperation with Ducks Unlimited, Canadian Wildlife Service, the Ministry of Agriculture, and the Comox Valley Farmers’ Institute. The program not only protects this once-endangered species, it also respects the rights of local farmers. Despite the fact that they look so spectacular grazing on lush green fields, these magnificent birds can cause massive destruction to farmland. They are, after all, really big birds. With a wingspan of 2.5 metres (eight feet) and weighing a whopping 11 to 13 kilograms (25 to 30 pounds) the Trumpeter swan is the largest native North American bird. They are powerful flyers, capable of speeds up to 80 kilometres per hour in flight. 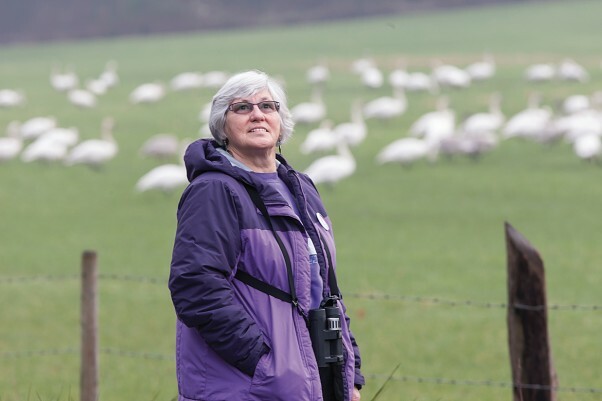 Every week from October to the end of March volunteers like Steph Nathan travel to 21 different Valley locations to count swans. They are also voracious eaters. One swan will consume about 4.5 kilograms (10 pounds) of grass in a single day. A flock of 10 swans consumes as much as a single cow. Multiply that by 2,100—which is the average number of swans that winter here each year—and you can imagine how their eating habits damage crops. From an historic perspective, the Trumpeter swan has not always been a cause for concern. According to First Nation’s history, long before local European settlers began farming this ‘land of plenty,’ Trumpeter swans were not seen on Vancouver Island. They were, however, quite prolific in other parts of North America. They migrated from their summer breeding grounds in Alaska and the Arctic to various regions of North America for the winter. As far back as the 1600s through to the early 1900s, European settlers hunted Trumpeter swans indiscriminately for their meat and skin, as well as their snowy white down and feathers. The largest flight feathers were particularly prized as quill pens. Hunting, combined with habitat destruction, eventually decimated the swan population and it was thought to be near extinction. In 1917, the Trumpeter swan was declared a legally protected species in Canada and the USA and hunting was banned. The population slowly grew and today Trumpeter swans are seen as a ‘vulnerable species’ instead of an endangered species. Yet they remain on the protected list. Although illegal hunting undoubtedly still occurs in some regions, the risk of decline from over-hunting remains minimal and the elegant Trumpeter swan can be considered a restoration success story, particularly on Vancouver Island and most notably in the Comox Valley. Such a success story is rarely found in conservation. 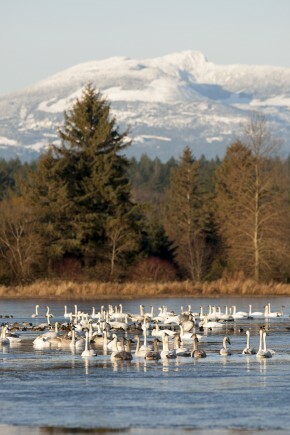 Of the more than 33,000 Trumpeter swans in North America today, an estimated 6,000 now winter on Vancouver Island. Some venture farther north, to Haida Gwaii; others winter in Port Alberni or the Cowichan Valley region. The majority, however, flock to the Comox Valley. If it snows here, and the ponds and fields freeze over, the swans simply take a vacation and move on to Great Central, Comox and Nimpkish Lakes. They return to the Comox Valley a few days later, once the ice has melted. Trumpeter swans were first recorded in the Comox Valley in 1963 and, by 1978, 250 were present. An abundance of grasses, roots, and tubers from the intertidal and shallow ocean zone in the Courtenay River Estuary and wide expanses of farmers’ fields, rich with lush grasses, were the main attraction. While considered to be a beautiful and peaceful bird, as the population continued to grow, farmers began experiencing significant economic losses as a result of the birds stripping well-established perennial grasses from their fields. By the early ‘90s, while some people heralded the annual return of the Trumpeter swans, bringing with them a barrage of tourists and economic benefits for the community, farmers were completely fed up. Not only were swans consuming massive amounts of vegetation, often overgrazing perennial grass, pulling it out by its roots and compacting the soil with their large webbed feet, in flooded fields they created bathtub-size craters while searching for unharvested potatoes and carrots. They had become a veritable nightmare for local landowners. Recognizing that something had to be done so that the Trumpeter swans and the farmers could co-exist, Graeme Fowler, a fish and wildlife technologist and consultant with Ducks Unlimited and the Ministry of Agriculture entered the picture. “Ducks Unlimited, together with the Canadian Wildlife Service and other organizations, launched the Comox Valley Waterfowl Management Program in 1991, to address the swan/agricultural industry concerns,” explains Fowler. “The swan counting that Steph Nathan participates in today is part of this program. McClintocks Farms owner Jerry McClintock, a member of the Farmers’ Institute, doesn’t have any problems with the swans himself, but he knows many people that do. In addition to monitoring the swans’ feeding habits, effort is also put in to protecting them from the ‘unnatural’ hazard of electrocution. BC Hydro assists by hanging short pieces of pipe from string on power lines where birds—not just swans—frequently fly. Not only can a bird/hydro line encounter be deadly for the bird, it can result in power outages. If you drive along Comox Road you can see these pipes hanging from the power lines. The Swan Festival continued for a number of years until a lack of volunteers willing to orchestrate the event ultimately brought about its demise in the early 2000s. Also, the ‘novelty’ of the annual Trumpeter swan migration had simply lost some of its appeal for tourists. Thousands of Trumpeter swans were now also wintering in other parts of Vancouver Island, the lower mainland, and the state of Washington, so nature lovers didn’t need to travel this far up island to see them. Much to the relief of the agricultural community, what was feared to blossom to a population of more than 10,000 swans has naturally capped out at about 1,800 to 2,500 for the past 10 years. We know this is statistically correct because of the many years of volunteer efforts of people like Steph Nathan. The swans, it seemed, had adopted a bit of a self-management program all on their own and this is just the right number to ensure a healthy and disease-free swan population. It was considered a pivotal year in both Comox Valley and Ducks Unlimited history when, in 1998, the vast expanse of farmland on Comox Road—formerly called Farquharson Farms—was jointly purchased by Ducks Unlimited and other partners in the Pacific Estuary Conservation Program. Now called Comox Bay Farm, the 192-acre property is a productive farm in spring and summer and a winter refuge for Trumpeter and Mute swans; Brandt, Canada, White-fronted and Cackling geese; several types of ducks and a myriad of other birds. Comox Bay Farm is designated as a wildlife refuge in perpetuity. Other conservation properties have been added since then. You may also notice large mounds of potatoes—a favorite food of swans. These culled potatoes are dumped on Comox Bay Farm as part of the management program. Since 2000, Ducks Unlimited has carried the program on its own while, at the same time, continued to engage other industry and community stakeholders, including the Comox Valley Farmers’ Institute. “By now we had minimized the swan scaring tactics and were focusing on habitat development,” notes Fowler. “We continue to work with farmers to ensure they planted winter cover crops and on various ways to manage drainage problems on certain farms, with the goal of mitigating damage to fields. While still supporting the swans, we make a real effort not to do anything that would falsely support the swan population. Many years of collaboration, dedication and ingenuity has gone into ensuring that swans and people can live in harmony in the Comox Valley. Swan festival or not, this truly is a conservation success story worth celebrating. but Springett knew it was a young fawn. For three days and three nights the calls had played like a heartrending soundtrack in the background of Springett’s daily life. As someone who had spent her life caring for, training, and observing animals, Springett was fully aware of the advice given by wildlife experts: never touch an apparently abandoned fawn. But during that third day, the fawn’s cries were becoming weaker by the hour. As the early June afternoon waned, the temperature started dropping. Springett fully agreed with the wildlife experts, but she also knew that this fawn was in real danger. As Springett wondered whether or not to intervene, she knew that sentiment should have no place in her decision. Of course, the idea of saving a baby deer was heart-warming, but the real questions were pragmatic. What were the chances that the mother would return? How much longer could the fawn last? And did Springett have the knowledge and expertise to provide the appropriate care, so that the fawn could return to the wild successfully? As the shadows lengthened on that third day, Springett made her choice. She walked into the forest and scooped the fawn up. It was surprisingly light, and alarmingly bony, and hardly struggled at all. The fawn felt like a bag of bones in Springett’s arms as she carried it back to her house and lay it down beside her pet Great Dane, Kate, on Kate’s bed. Thus began an extraordinary cross-species friendship that continues to this day, and has inspired people all over the world. It has also changed Springett’s life, putting her and her 35-acre hobby farm in the international media spotlight and connecting her to people from just about every country on the globe. None of this was in Springett’s mind that June afternoon when she unceremoniously introduced the two animals. She was thinking the fawn needed to warm up, and she wanted to do that in a way that was as close to nature as possible. “I knew I had to treat her like a deer, not a pet,” Springett says now, five years later. “I never cuddled her, never put her on my lap, never invited her onto my bed. I provided the basics but otherwise I was simply a chaperone.” The only concession she made to the human urge to turn animals into pets was to give the fawn a name, Pippin. Springett brought a lifetime of experience with animals to her “chaperone” role. She was born with Asperger’s Syndrome, a condition on the autism spectrum. Like many others with Asperger’s, Springett often felt distanced from people, but found she had an unusual ability to understand and work with animals. As well as being an accomplished equestrian and trainer of horses, Springett has worked for feed and farm outlets, held positions as a veterinary technician and animal control officer, been involved with animal rescue, and made numerous trips to the Brazilian rain forest to observe and photograph the wildlife there. “I’d say I’m better with animals than with people,” says Springett. But of course it is Kate, the dog, who deserves credit for the relationship with the deer, Springett hastens to point out. A sleek black Great Dane who stands three feet tall at the withers, weighs in at 112 pounds, and radiates calm dignity, Kate has a “100 per cent reliable” disposition, says Springett. Instead, she began to nurture it, and the fawn responded. Kate began grooming Pippin, and staying close by, keeping a motherly eye on the orphan. She even let the fawn nurse on her milk-less teats, providing emotional nourishment (Springett provided the physical nourishment by bottle). The two animals slept in a cozy heap. And once Pippin gained strength, the two animals started playing—chasing games, hide and seek, and all kinds of goofy, bouncy fun. At first Pippin slept in the house, but one evening about two weeks after she’d been brought in, she headed back out to the forest to sleep. She returned the next morning for food and companionship, but from then on she slept in the forest every night. Watching Kate and Pippin reunite every morning was the highlight of Springett’s days—an ecstatic frenzy of bounding, leaping, running, face-licking, tail-wagging and nuzzling that clearly proclaimed “I love you” in Kate and Pippin language. Over the next few months, Springett watched with satisfaction as Pippin connected with other wild deer and became part of a herd. Her goal had always been for Pippin to return to the wild and live with her own kind. At the same time, she and Kate still enjoyed Pip’s daily visits. And the next spring, they were thrilled when Pip showed up with a fawn of her own, to introduce it to the extended family. Springett felt deeply grateful for the opportunity to be a chaperone of, and a witness to, such a unique and beautiful relationship. But she was soon to find that the Kate and Pippin relationship held yet more gifts for her—and for many others. Springett, a professional photographer, had been documenting the evolving friendship from the beginning in stills and videos. Rather like a proud grandparent, she shyly but enthusiastically shared these with friends and family, many of whom urged her to put the videos out on YouTube, undoubtedly the world’s best medium for cute animal footage. “And then of course people urged me to create a Facebook page. I basically gave myself a crash course in social media,” says Springett. It didn’t take long for the internet exposure to take effect. Soon the videos were getting thousands of views and long threads of positive comments, and Springett began to feel that she, Kate and Pippin were connected to, well… a worldwide web. Then US talk-show host Ellen DeGeneres found the videos, and played some of them on her show. “At that point everything just took off,” says Springett. Thousands of hits turned to tens of thousands, then hundreds of thousands and then millions (currently 2.5 million). Emails poured in from around the world. Newspapers and TV networks from all over featured the story. “It’s out there in Arabic and Swedish, and a bunch of other languages. It’s in Africa and Australia,” says Springett. National Geographic devoted an episode of their series, Unlikely Animal Friends to Kate and Pippin. PBS sent out a television crew who spent a week on Springett’s farm, with the resulting footage becoming part of a one-hour documentary, Animal Odd Couples, part of the PBS Nature series. In that documentary, Kate and Pippin’s story is the final instalment in a series of vignettes that include a giant tortoise and a protective goose, a coyote and a lion, and a goat who voluntarily becomes a seeing-eye guide for an elderly horse losing its vision. Indeed, Springett has made many connections thanks to Kate and Pippin’s friendship. Some of these are people she has never and will never meet, but nonetheless they have a meaningful bond. “I get emails from shut-ins, from people with chronic illness, from caregivers telling me how this story has touched their patients, from children and the elderly. They all say that hearing about this friendship and watching these videos makes them feel better. It keeps people going. I feel like I have a huge extended family. This story clearly hit a chord,” she says. It’s not just Kate and Pippin hitting that chord. Over the past few years, cross-species relationships have become a popular cultural theme, says Springett. As well as countless touching/funny/cute YouTube videos, the National Geographic Unlikely Friendships series, and the PBS documentary, a number of books have been published for both kids and adults. “The popularity of these stories is a sign of the times,” she says. “People are worried about the future. The news is all bad, but this is good news. The interest in cross-species friendships isn’t just a pop-culture phenomenon. Scientists also are taking note, as they seek to understand the emotional life of animals. The PBS nature documentary includes a number of animal behavior experts, one of whom points out that until about a decade ago, scientists wouldn’t even use the term “friendship” in talking about animals. That is changing as more and more scientists accept that animals have deep and meaningful emotional lives. Now in its fifth year, the Kate and Pippin friendship remains strong. Pippin still visits every day, bringing her fawns and other members of her herd. And Springett continues to document the relationship. Last year she collaborated with her brother, a writer, to create a children’s book called Kate and Pippin: An Unlikely Love Story, which was published by Penguin. This year she published a wall calendar, which sold out two days after being posted on Facebook. All this activity has boosted her photography career, she points out gratefully. But her deepest satisfaction comes from Kate and Pippin—from watching their dance of greeting each day, from seeing Pippin successfully moving into the matriarch role in her herd, from watching her fawns grow up and have babies of their own. Springett’s story may be heart-warming, but if you see a fawn lying alone, don’t intervene! Fawns are taught to lie very still, usually in the forest or in tall grass. The mother will leave her fawn for up to 24 hours to go feed, but will usually stay close by. The fawn’s stillness, which people can misinterpret as weakness, is a defence mechanism to protect it from detection by predators. Like Springett, Birch warns against making a pet out of a deer. “There was a recent case where some people took in a fawn and raised it. When it got older it became a pest. It wouldn’t go away. It would jump up on people and knock them over. It didn’t seem to know it was an animal. We have to let wild animals be wild. and I liked the music, view ” says Claude Bigler of how he first came to discover tango. Now an instructor, he teaches students like Christina Grandin, above, the close embrace tango on Wednesday evenings in Downtown Courtenay.” src=”http://www.infocusmagazine.ca/wp-content/uploads/2013/02/tango1-602×415.jpg” width=”602″ height=”415″ /> “I heard this beautiful music, and I liked the music,” says Claude Bigler of how he first came to discover tango. Now an instructor, he teaches students like Christina Grandin, above, the close embrace tango on Wednesday evenings in Downtown Courtenay. and her unlikley friend, Kate, quickly learned to communicate with each other. “It was like they worked out their very own language—Kate and Pippin language,” says Isobel Springett, who found the distressed fawn on her Dove Creek property. 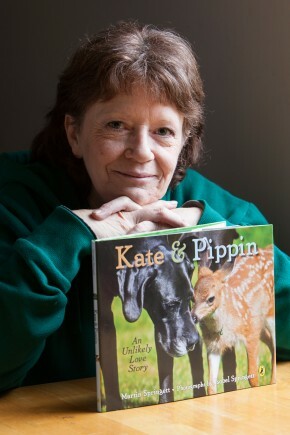 Photo by Isobel Springett.” src=”http://www.infocusmagazine.ca/wp-content/uploads/2013/02/kate-and-pip-602×399.jpg” width=”602″ height=”399″ /> Orphaned fawn Pippin, now five, and her unlikley friend, Kate, quickly learned to communicate with each other. “It was like they worked out their very own language—Kate and Pippin language,” says Isobel Springett, who found the distressed fawn on her Dove Creek property. Photo by Isobel Springett. For three days Isobel Springett had been hearing the cries coming from the dense forest behind her Dove Creek farm. The wailing sounded eerily like a human baby in distress, but Springett knew it was a young fawn. For three days and three nights the calls had played like a heartrending soundtrack in the background of Springett’s daily life. For more information about the story of Kate and Pippin go to www.kateandpippin.com. For more info contact MARS at 250-337-2021 or www.wingtips.org. For more information on how to respond to a fawn in distress, see the North Island Wildlife Recovery Association website at www.niwra.com.